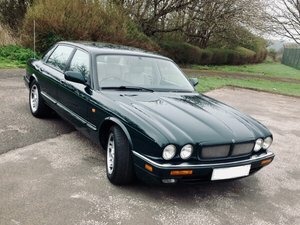 A glorious Jaguar XJ6 Sport 3.2 with 54,185 miles and one former keeper. Zinc coated body structure, side impact bars, longitudinal crumple zones, jewel-effect headlamps, headlamp wash, headlamp levelling, collapsible/adjustable steering column, electric heated door mirrors, driver and front passenger air bags, stability control, driver door switch pack, automatic climate control, electrochromic rear view mirror, electric height adjust seats, LCD display with rheostat control, trip computer, digital clock, spectacle pouch, engine immobiliser, factory fitted alarm, remote central locking, eight speaker sound system. 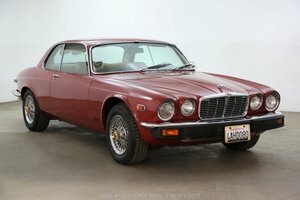 Dealer accessories: Jaguar 6-disc autochanger, Jaguar over mats, headlamp protectors, mud flaps. 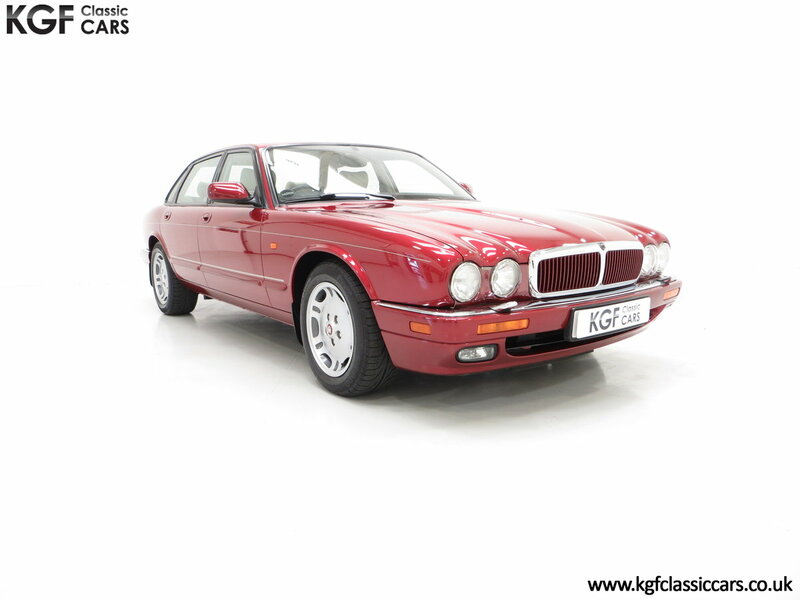 This beautifully opulent Jaguar XJ Sport is finished in original Jaguar Regency Red Metallic, (Code CFS), which has a deep lustrous shine and uniform finish. All the factory panels are straight with only light aged related markings visible and the twin coachline in unbroken. All the trim, chrome and rubbers are in excellent condition. The jewel effect lenses are perfect having been protected by Jaguar headlamp covers from new and the factory fitted glass retains all stickers and security etchings. Still sporting the supplying HR Owen Jaguar dealer number plates and rear window sticker, this example is truly unspoilt. 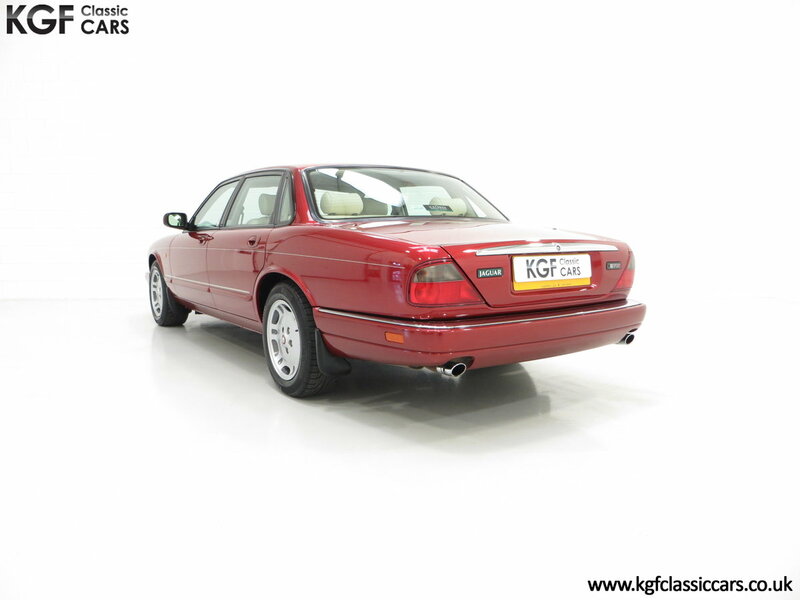 Graceful, sleek and with a low-slung stance, this car simply exudes elegance. 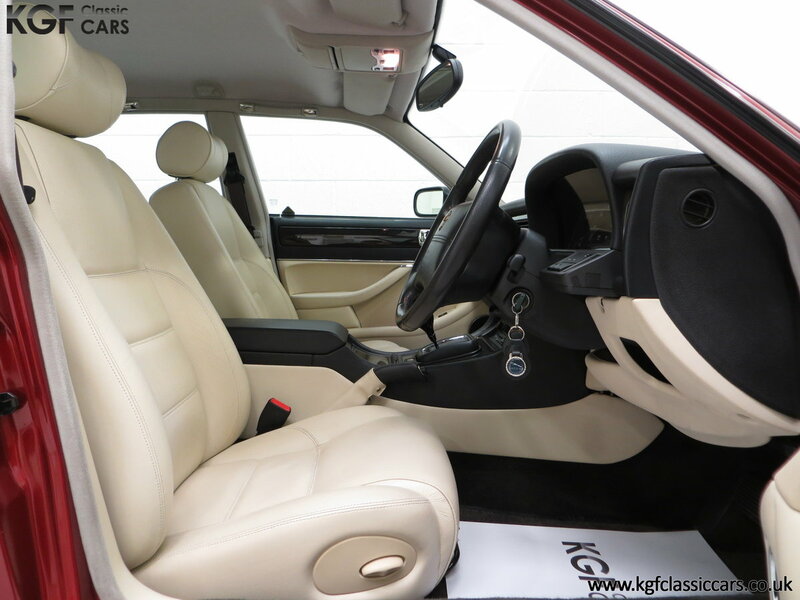 A sumptuous and luxurious interior is thoroughly commensurate with the pampered low ownership this car has enjoyed. The spotless upholstery is trimmed in premium Cream Leather, (Code NDR), with nothing more than miniscule hairline markings, utterly insignificant. The precision-fit facia surrounded in Birdseye Maple veneer and Warm Charcoal is superb, as is the often troublesome headlining. The driver has no shortage of equipment to assist pleasurable journeys and safety features all of which work perfectly, including the electric driver’s seat height adjustment, trip computer and factory fitted stereo unit. The folding mirror function is inoperative but the full electric adjustment in both works. The deep pile carpeting retains its factory fresh fullness having been protected by Jaguar supplied carpet mats from new. Sheer automotive indulgence with classic pedigree. The AJ16 3.2 all aluminium 24V engine is designed and manufactured by Jaguar to produce 216bhp and 315Nm of torque. 0-60 is despatched in 8.9 seconds and a top speed of 139mph is possible. The engine bay is spotlessly clean and all factory plates and stickers are displayed making it perfect for bonnet-up exhibiting at classic car shows. The electronically controlled, sealed-for-life five-speed automatic transmission is seemless and in harmony with the powerplant, it offers true Jaguar refinement and sporting intensity. The beautifully ornate 16in diamond polished alloy wheels are in perfect condition with a stunning mirror finish. The red and gold Jaguar growler badges are vibrant and unmarked. All wheels are shod in Pirelli P6000 225/55 R16 tyres with plenty of tread including the spare. The vacuum assisted four wheel disc brakes ventilated front and rear with ABS braking system and YAW control offers safe stopping power. 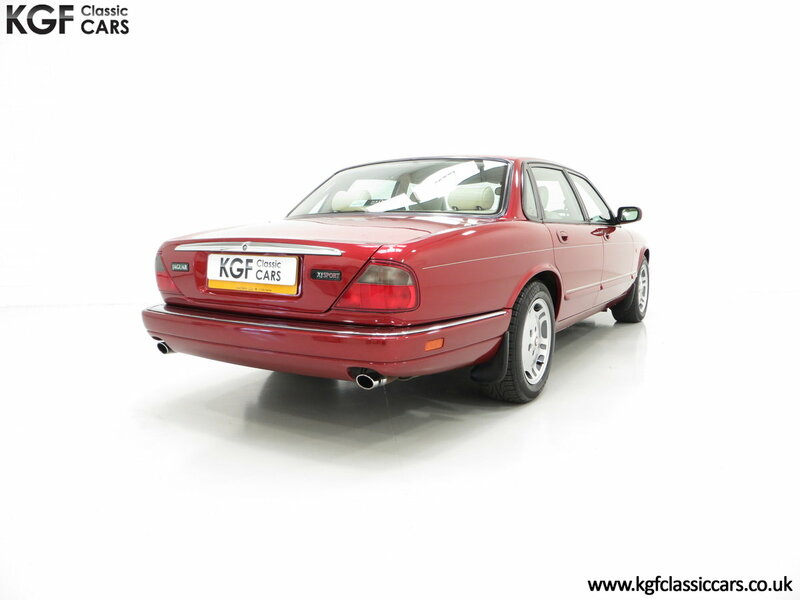 This Jaguar XJ6 Sport 3.2 (X300 model) was registered new on the 8th August 1997 by Jaguar Main Dealers HR Owen of Colchester. The first custodian cherished the car for 21 years until September 2018 and his passing whereby the only other keeper took ownership. The Jaguar leather wallet contains all handbooks, guides and dealership point of sale material including factory security data cards but despite regular servicing on the first owners passing all service literature was misplaced. The last service was carried out in April 2018 when the second owner purchased the car. Three sets of keys are included. 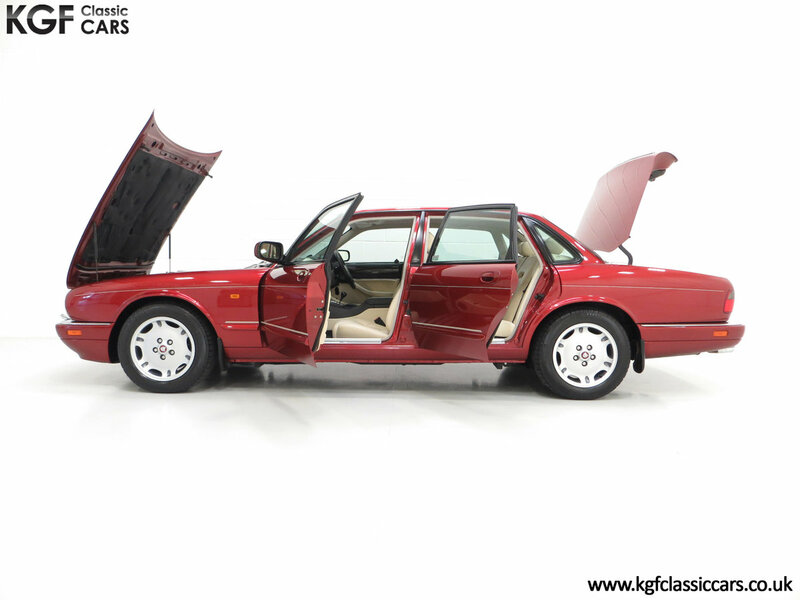 A beautifully presented and immediately apparent cherished and garaged pride of joy. 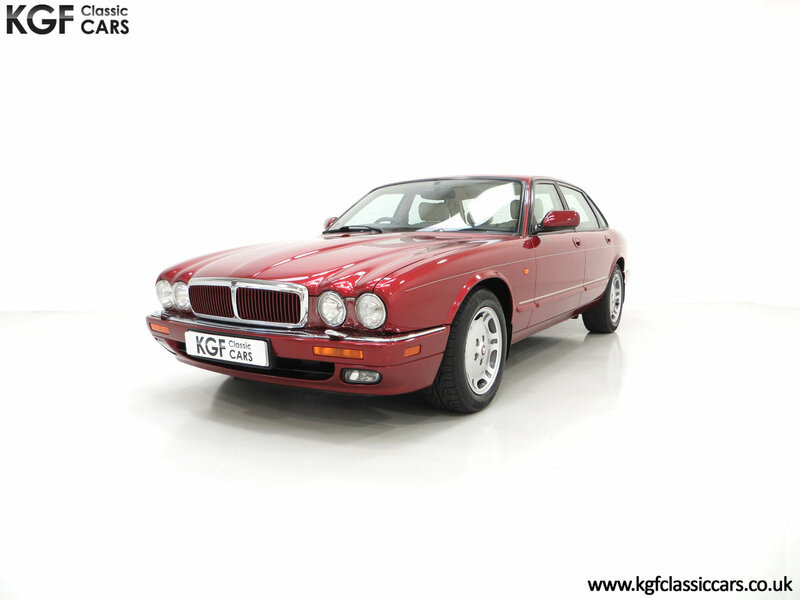 1997 Jaguar XJ6 3.2 AJ16 engine, only 61k Amazing car!